An avulsed tooth is one which is completely out of its socket. Avulsed adult teeth require re-insertion ASAP. Handle the tooth by the crown (and as little as possible). Place the tooth in milk or saliva, but do not keep it in the patient’s mouth. If it is a permanent/adult tooth this is a Dental Emergency and the prognosis following re-implantation worsens after only 15 minutes! Call Max Fax for these. 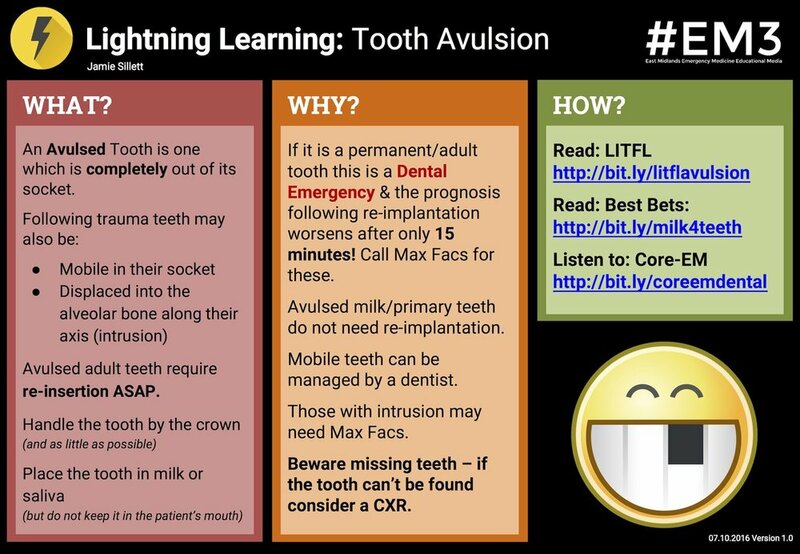 Avulsed milk/primary teeth do not need re-implantation. Mobile teeth can be managed by a dentist. Those with intrusion may need Max Fax. Beware missing teeth – if the tooth can’t be found, consider a CXR.